Click the book icon at the bottom of the main panel to open the database panel. Select a project and all the folders, drives, tapes and volumes will be shown in the Media table. Select a Media name, file type or enter text in the search boxes and the project assets will be shown in the main table. 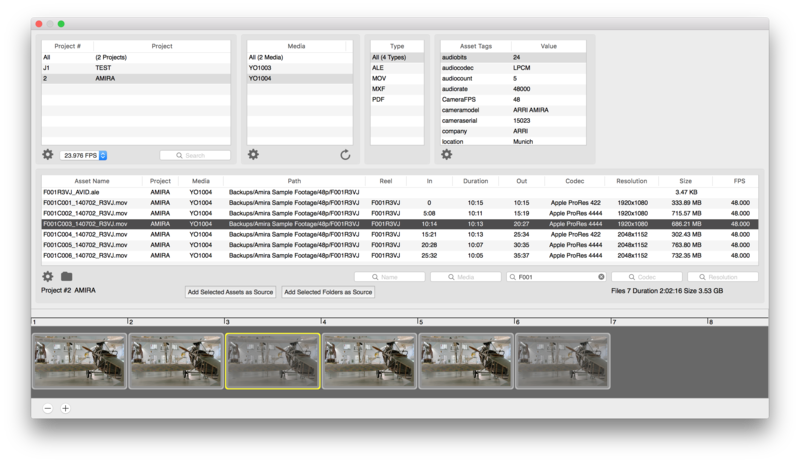 Project assets include video, audio and metadata files. Other files will be archived, but will not be listed in the database. Search using part of the name or path. Here there is a filter of F001 set in the path field. Also use the asset type, resolution or codec to narrow down results. The search now shows 7 assets that match a path of F001 and they are all on LTO tape YO1004. The asset names are grey as the media is not online. This search was inside the current project, sometimes you do not know which project the asset belongs to. Select All at the top of the Project table then the search will be across all projects. The project name is shown in the Asset table. Locate the media, in this case tape YO1004 and mount it and refresh the Media table. 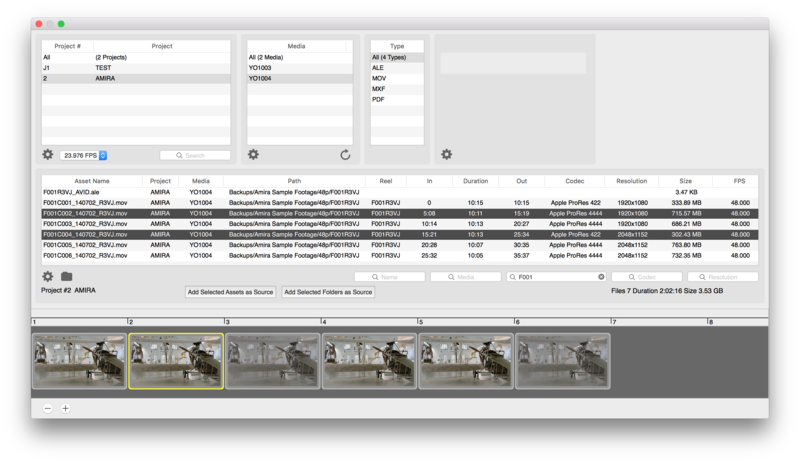 Select the tape in the Media table, now all the asset names are black showing that they are available. Select the required assets and click Add Selected Assets as Source. Now there is a new source that will copy the selected assets. In this case two movies will be restored. If the Trancode option is enabled then they can be converted to a different format. Select any asset that is in the required folder. Now click Add Selected Folders as Source This movie is in the F001R3VJ folder. There is now a source that points to the F001R3VJ folder. All the files will be restored. 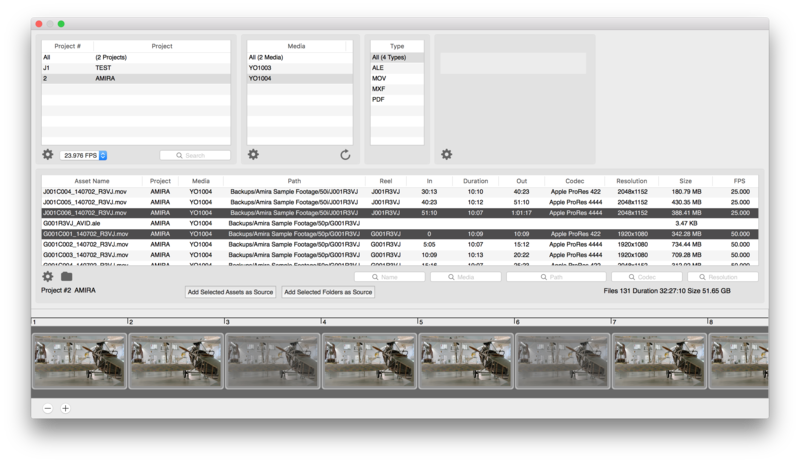 In the Edit paths panel Parent and Base name tokens have been added to the restore path. Select one asset in each folder. Again click Add Selected Folders as Source. Here shots G001 and J001 have been selected. There is now a single source that points to multiple folders. These folders could be on different archive media. So a single restore can copy folders from different volumes, tapes or drives. All media must be mounted, so with standalone LTO you will need to mount each tape manually. With many tapes it may make sense to use YoYotta Automation with an LTO library.